3rd tri. Music Cafe Announced! Three Locations This Time! Thread: 3rd tri. Music Cafe Announced! Three Locations This Time! A nice surprise to get late on a Monday! Digimon Adventure tri. is returning to Ani-On Station! "Digimon Adventure tri. 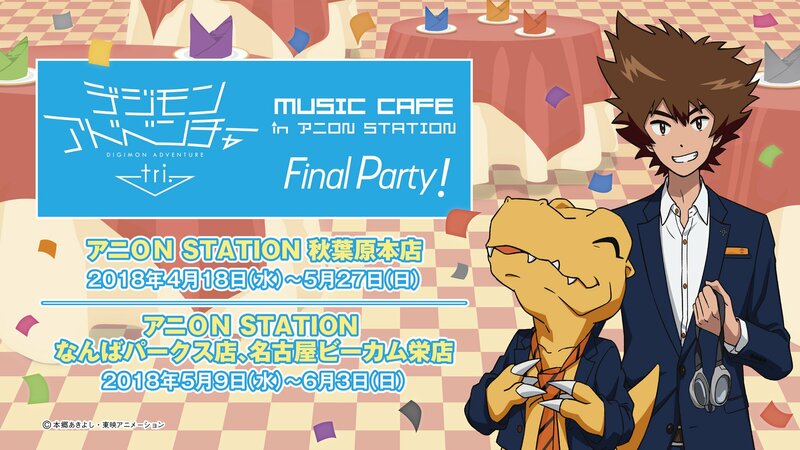 Music Cafe in Ani-On Station Final Party!" will be held at three different Ani-On Station locations to celebrate the release of tri. part 6. It will be held at the Ani-On Station Akihabara between April 18th and May 27th. And at both the Ani-On Station Namba Parks and Ani-On Station Nagoya Become Sakae locations between May 9th and June 3rd. The theme for this one is simple and fun: The "Chosen Children" will be holding a party for the fans! Taichi and Agumon and the others will come together for the party and as always, will greet everyone dressed up in different outfits. They sample the key art and outfits by showing off Agumon and Taichi! Like previous events at Ani-On station, we expect special programming and music, along with a themed menu and products on sale using the new artwork. More details will be announced on March 29th. Details from the 2nd Music Cafe in Ani-On can be found here and here. Details from the 1st Music Cafe in Ani-On can be found here. The sample/teaser image was put up in very high resolution. It was shrunk for embedding, but the full image can be found in the gallery. Thanks for the news!! Taichi is so gorgeous!! I really love this art style he looks so good in this! And agumon looks cute!! I already like the theme! Looking forwars for the other kids! How does it work? Is it the VAs greeting or is it just themed food and such with pictures in the wall? Ha ha ha. Agumon in a coat and tie. Isn't that fancy cute. This could be fun.